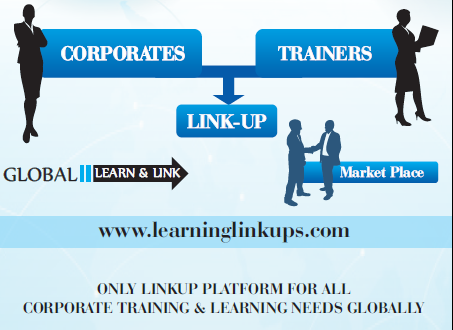 www.learninglinkups.com is one of its kind portal which will serve as a “Link-UP” between Corporate Trainers & Facilitators with the learning needs of Corporate Learning & Development Industry. It will be a convergence platform where ideas, philosophies, challenges, innovation & market dynamics will be exchanged to shape the future of Learning & Sill Development Industry. With this sustainable communication channel in place between the two bodies we envisage to Institutionalise Learning & Skill Development in India. Learning Linkup will strive to create various touch points between Corporate Trainers & Facilitators and Corporate Learning & Development Industry with Portal, Monthly Newsletters, Learning & Development Events, Conclaves, Periodic Summits and Workshops. These possibilities will serve as a great avenues for various exchanges between the two entities. "To Be World Leader in Linking up Intellectuals"
www.learninglinkups.com is a convergence portal which “Links-up” Corporate Trainers & Facilitators with the learning needs of Corporate Learning & Development Industry. It’s a subscription based portal available for Corporate Trainers & Facilitators providing them with products & services on a platform that links them up to the Industry. The Corporate Learning & Skill Development Industry can access this platform freely and use the services on offer from our patrons at their convenience. Corporate professionals can Linkup with Registered Corporate Trainers & Facilitators on the portal in a hassle free manner and at no charge to them. They can also register for free to our online knowledge portal created our Trainers & Facilitators. Moreover they can share their suggestions, queries and other dynamics in appropriate forums and feedback mechanism provided on the portal.